Are you looking for iPad mini holders for home or business use? These ultra-convenient little computers pack all the usability features of earlier iPad generations into a small package, but don't always fit into cases designed for larger versions. Our handheld and locking iPad mini holders are designed specifically with this size tablet in mind. In addition, we also offer a wide variety of "universal" tablet cases and brackets that will support almost every size device or accessory. Locking iPad mini holders, like other commercial-grade Apple tablet stands, are perfect for business use in public environments. Residential and personal-use models, on the other hand, generally don't offer case locks but can all, even the most elegant leather covers, be easily secured with cable locks. The convenient size of these small handheld devices makes them ideal accessories for holding notes, speeches, presentations and more in almost any commercial, professional, institutional or home environment. 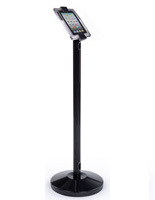 What kinds of Apple tablet stands can be used as podiums? 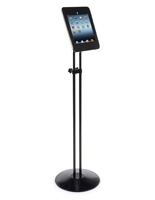 Freestanding iPad mini holders make great lecterns. The small size is belied by the advanced visual technology that makes the screens easy to read and scalable. Our floor standing cases offer locking enclosures for security, tilt and swivel for usability, and easy portability. This type of bracket is perfect for in-store interactive displays as well, and some models can be bolted in place for maximum device protection. 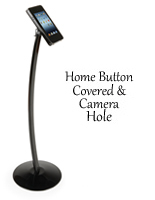 Countertop iPad mini mounts are great for use at trade shows, meetings, conferences and presentations of any kind. Universal tablet brackets or sized enclosures make it easy to insert and remove devices as needed. While some of these styles offer fixed displays that will not move, others offer full tilt, swivel and rotation for maximum visibility. Handheld cases and covers come in a huge variety of styles, from convertible wallet style leather Apple tablet stands to tripod-style iPad mini mounts that include their own carrying case to simple brackets that will hold a variety of size devices. 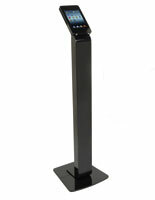 This type of accessory is great for "on-the-go" use as a display for notes, music stand or even presentation player. Portable holders are perfect for students, salespeople, retail staff or simply for personal use as e-readers, media players, recipe holders and many other uses. Our huge selection of mini holders spans the full range of styles, including adjustable-height freestanding steel enclosures with multiple locks, convertible floor-to-counter universal tablet brackets, and lightweight, portable leather or plastic covers that convert easily to tabletop locking Apple tablet stands. Each accessory cover, holder and bracket is designed specifically to take full advantage of the versatility and flexibility of the smallest member of the Apple tablet family, and to fit perfectly with any environment. Like larger tablet enclosures, these smaller handheld cases allow tilt, swivel, rotation, hands free operation, and much more.